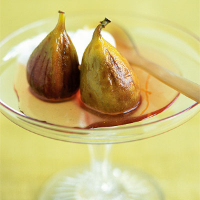 Succulent and dark, Turkish figs are perfect at this time of year. Poached in cardamom and rose scented syrup, they can be served warm or chilled. Place the sugar, orange zest and juice, cardamom pods and 300ml cold water in a medium pan. Stir over a moderate heat until the sugar has dissolved, then bring to the boil. Add the figs and reduce the heat to a simmer. Cover the syrup and figs with a circle of baking parchment carefully pressed down onto the syrup. This prevents the figs from bobbing up and reduces the evaporation of the syrup during cooking. Cook for 8 minutes, until the figs begin to soften, then remove with a slotted spoon to a serving bowl. Simmer the syrup for a further 7-8 minutes, to reduce slightly, then stir in the rose water. Pour the syrup over the figs and allow to cool slightly. When serving, allow 2 figs per person. Pour over some of the syrup and serve with a generous spoonful of Greek yogurt. The rose water has a strong flavour, so you will only need a few drops. It will keep well in your cupboard. If you prefer, substitute the rose water for orange blossom water, or add a tablespoon of orange flavour liqueur. Instead of cereal, try serving this dish chilled with low fat bio yogurt for breakfast.